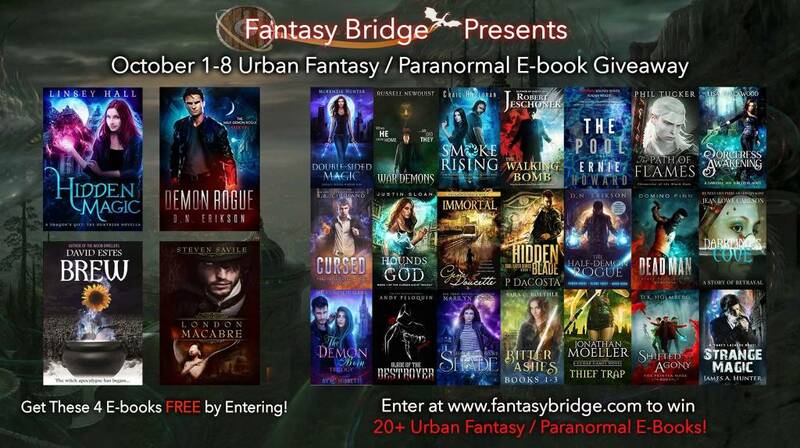 Win 20+ Urban Fantasy / Paranormal Books! Fantasy Bridge is dedicated to bringing you exclusive deals, new releases, and other exciting news from your favorite Fantasy authors straight to your inbox! Its Captains are excited to bring you an Urban Fantasy / Paranormal Giveaway that’s sure to keep you up all night reading. There are FREE Prizes available for all who enter between October 1 and 8, plus the chance for 5 winners to receive 25+ e-books from Fantasy Authors of every stripe. One grand prize winner will win those books and a $25 Amazon Giftcard!